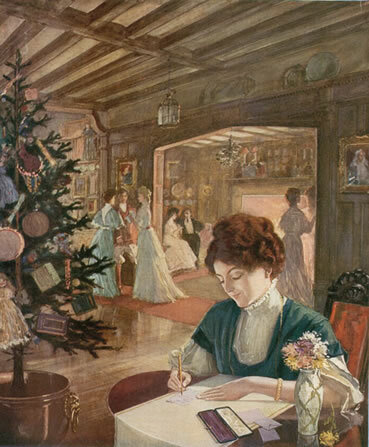 This month, rather than my pithy ponderings on the Edwardian era, you shall hear nothing but the scribble and scratch of my ink pen over reams of paper as I work towards 50,000 words by the end of the month. No, I’m not drafting a constitution, but I am crafting my magnum opus (err…not really) for National Novel Writing Month. I am going to complete my Mills & Boon New Voices entry, A Mayfair Seduction, which I categorize as a bit of Downton Abbey with a dash of Sabrina, and a generous dallop of Edwardian cookery. Follow my progress on Twitter @evangelineh or over at the NaNoWriMo forums. Also, please read and vote for my entry in The Season For Romance’s ‘Tis the Season Writing Contest. The winner receives a 25 page critique from an agent or editor, and a $100 gift card! I know my wonderful and loyal readers will help me in this endeavor. *g* Read The Rules of Desire here and please leave comments!. And last, but not least, I am so proud and thankful for not only hitting over 300,000 unique views at Edwardian Promenade, but for the enthusiastic response to my mini-magazine, GILDED. Sure I provide the information, but this site wouldn’t be where it is today without all of you, my visitors! Posted in Literature | Comments Off on November! It took a lot of gumption and even more courage for women of the Victorian and Edwardian eras to pack their trunks and set off for parts unknown. Despite the sharp edge of colonialism’s knife for the oppressed, the movement of European and American powers into Asia, Africa, South America, and the islands dotting the Pacific Ocean created opportunities for both men and women, but for women, it served to push them beyond the typical spheres of the domestic hearth and home and equally challenged notions of femininity. Though a few women penned their observations of non-European societies prior to the nineteenth and twentieth centuries (most notably Lady Wortley Montagu), this new wave of lady explorers traveled globe not as mere appendages to their male kinfolk, but as scholars in their own right. They purposefully observed the customs and people of foreign lands with the eye of an early anthropologist, took note of the land and foliage like a botanist, and detailed the past inhabitants of the land like archaeologists. Far from adhering to the long-held horror of a woman publishing under her own name, these brave and intelligent lady explorers knocked at the doors of the overwhelmingly masculine Geographical societies to demand their findings be presented and taken just as seriously as a Livingstone or Burton.